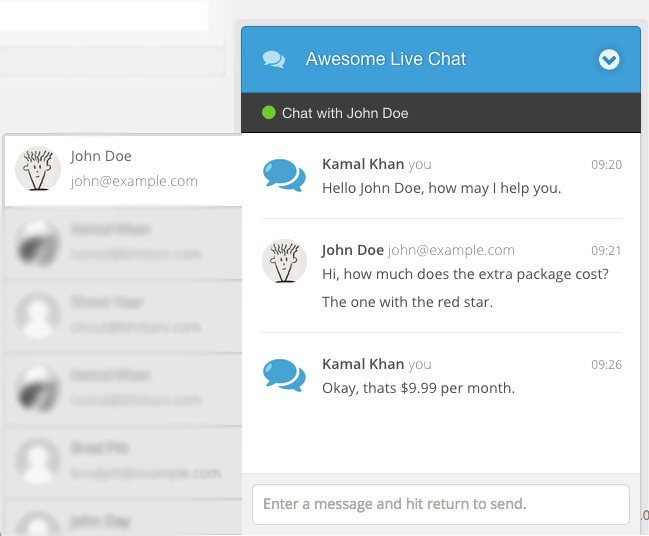 Provide awesome support for your customers and increase the potential clients. 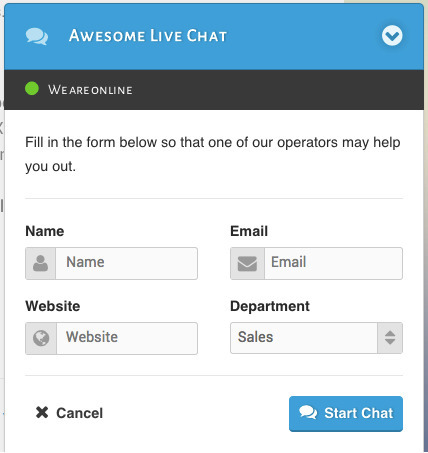 Awesome live chat was built with care and good technologies all around, including coffee script and less for smooth development with high OOP PHP structure. Yes! The chat experience transfers over to other tabs that people visit during a chat. Never loose a client running away. Visitors will feel a responsive feel whether using desktop, tablet or mobile. There is no limit to the number of operators you maintain. Have as many of them as you desire. Departments are infinite. All depends upon your organization. Office hours closed? Let visitors send you offline messages. 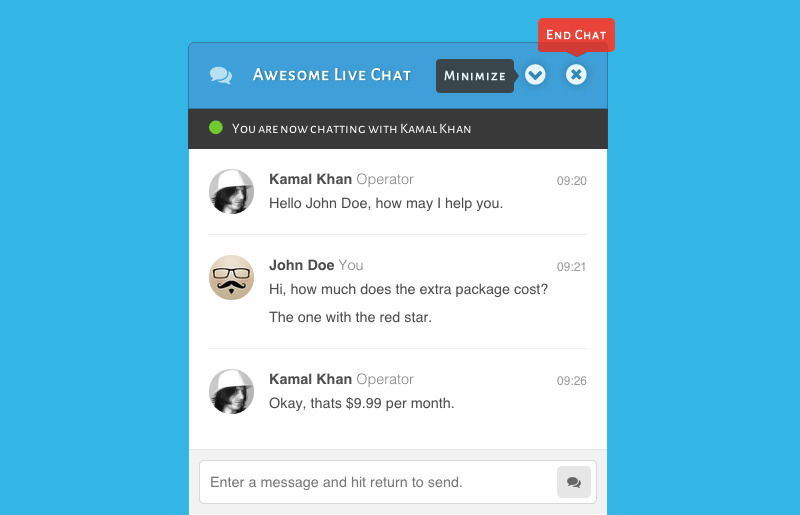 Visitors have the ability to send themselves a transcript of the chat session. You will find out where your visitors are coming from, including the country (with a flag) and ip address. First time seen dashboard. All smooth, slick and responsive. Adjust the plugin from the dashboard intuitively. Since v1.2.7, you may embed the iframe with no cross domain restrictions, however there will be no support for iframe embed as this feature is out of the scope of WordPress. Where example.com is the root url to your wordpress website where you have installed the plugin. If you already have jQuery loaded, you may remove the jQuery include from the above code but make sure you include the required scripts after jQuery. Fix: Messages associated with the visitor were wrongly associated with the operator in chat transcripts. Chat message MYSQL type updated to text instead of tinytext. Department name MYSQL type updated to varchar(255) instead of tinytext. Use custom metabox for woocommerce products to fix select2 bug. 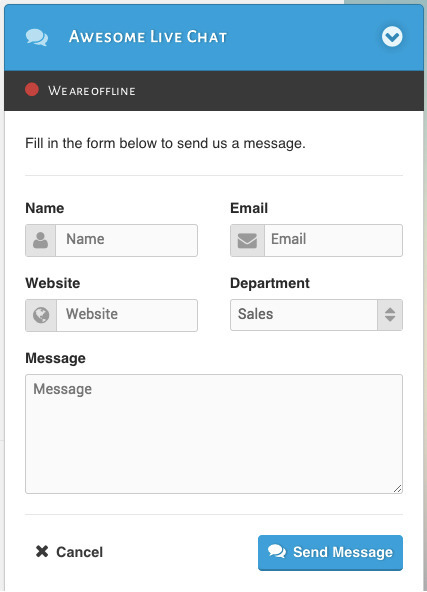 Allow operator dashboard access under woocommerce. Allow chat in custom post type archives. 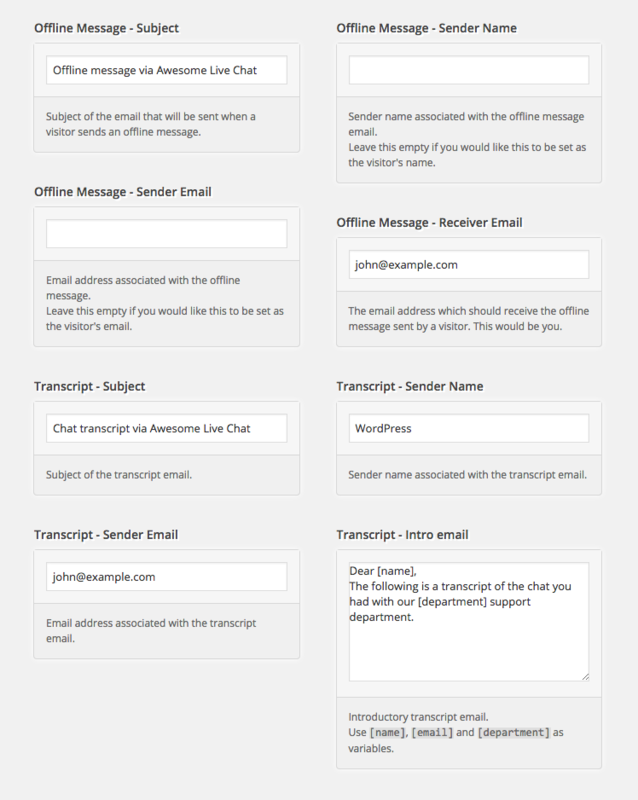 Fixed js form submission for chrome version 56. Purchase code activation nag removed. Use wpdb charset_collate to support global language characters. Fix db key constraints for InnoDB. Set default timeout to 3 seconds. Use error notice and allow dismissal for license key activation. Fix: Delay app initialization till dom load. Update: Auto assign the default department to the current admin after first installation. Update: Use http://freegeoip.net for geo ip api. Fix: _.template js call for wp 4.5. Update: Default timeout to 10s. Fix: Chat forwarding to correct department. Fix: Force https for gravatar urls. Fix: Referral url when using iframe..
Add: .alc-op class to [operator] in status bar. Add: Allow visitor and operator meta string edits. Add: Adjust ajax long polling timeout. Useful when encountering 500 Internal Server Error. Update: Gravatar to work with https. Update: Limit timeout for requests to 110 seconds. Add: Auth method by POST. Add: Made update check if new version installed. Fix: Chat end when not supposed to for some users. 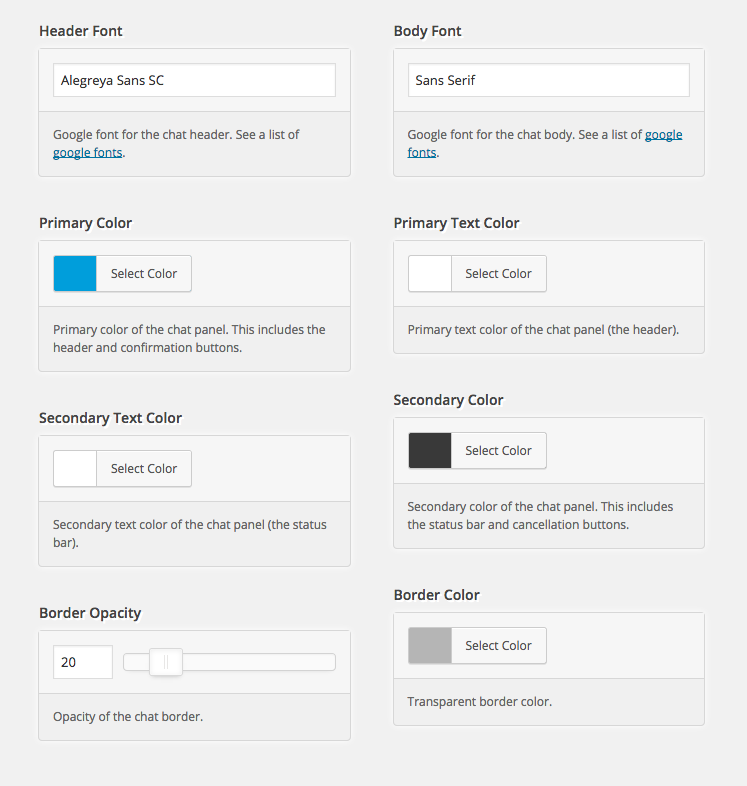 Update: Made iframe available for non wordpress including cross domains. Update: Removed js source mapping for vendors causing errors in console. Fix: IE 10/11 bug in ajaxio causing connection error while connecting. Fix: Add first param for operator-auth. Missed in previous release. Update: Using absolute path to include frontend chat. Update: Uninterrupted reconnection on frontend when using sockets. Fix: Tweaked chat experience when using sockets. Update: Seamless reconnection on socket. Update: Made email field optional. Update: Now generating links using Autolinker.js. Its great! Fix: Welcome message when using socket connection. Fix: Flags when using socket connection. Update: Api for server consistency. Update: Revamp license verification process by attaching separate buttons. Fix: Timestamps when using server. Fix: Title text color to update when skin modified. Fix: Default settings for new additions. Add: Choice of no chat panel if offline. Add: Optional referral link choice. Fix: Operator initiating a chat to himself only. Fix: Hide dashboard for operator fixed. Fix: Time locale for different regions. Fix: Filtered/Escaped script characters from template scripts. Fix: Made socket port optional for using socket server. Fix: API for verification of buyers. Fix: Verify and Unverify now works. Add: Seamless integration with upcoming socket server.